Very good afternoon to everyone present here. Today I am extremely delighted and pleased to present before you the Saga of a man who had been in a constant struggle for the betterment of the nation throughout his life in spite of tremendous struggles and hurdles that destiny had put him through. The man I’m going to talk about today is none other than the esteemed Missile man of India, as well as its 11th president, Dr APJ Abdul Kalam. The life of Dr APJ Abdul Kalam is a living exemplification of hard work, struggle and success. There is a lot for us to learn from the life of this simple yet extraordinary man. Dr Kalam was born into a mirror class Tamil family in an island town of Rameshwaram in the state of Madras. His father Jainulabdeen didn’t have any kind of formal education and no was he wealthy. However in spite of all these hindrances he had in himself great wisdom and it truly generous spirit. Dr Kalam’s mother, Ashiiamma, was a lady full of care for everyone was a lady full of care for everyone around. She left to feed people and every day at home they said far more number of people than the total members of their family. From this week and get an idea of the kind of family doctor Kalam belong to. This this sort of generation open minded family background have to wait for the man who was to become one of the greatest in the history of our nation. Since early childhood optical instruments want to study science. knowing the unknown had always been what he’s tried for. We must remember hear that no one can become great without a great teacher and it is only the student that has hope of surpassing his teacher. D art film had a great Physics teacher at school we had been instrumental in shaping his scientific inquisitiveness analysing it in a fruitful manner. But little did you know that one day this short man with undistinguished looks good revolutionize the entire world of science  and help India make a name for itself in the horizon of world scientific community. There is a lot to learn from the life of Dr Kalam and his struggles. He had almost no means to study engineering which was his field of interest. His parents had to sell family belongings in order to accrue fees for his college education. Since college hints of leadership were visible in him. Once he was given a project to complete which was to design an aircraft. However his friends are quite behind the schedule. In order to make up, he himself completed the entire project himself without sleeping for almost 2 days and presented it to his teacher who was awestruck. Not only did you have a tremendous capacity to work, his indomitable spirit is also something that we should learn. Dr Kalam since the days of his early student life had a desire to fly. So he applied for the test for being a fighter jet pilot. He was rejected narrowly and placed 9th for the post which had only 8 vacancies. This defeat was extremely damaging to his morale. 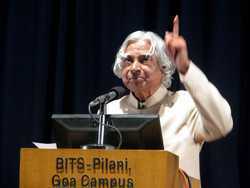 However, he did not give up and later made a career flying spacecrafts with Indian Space Research Organization. There is a lot to learn from his leadership skills too. In the seventies he was given the task of being the project leader for a team which was to land satellite into the orbit. However because of Technical complications spacecraft on its way broke down and fell into the Bay of Bengal. During the Press Conference, Dr Kalam took entire responsibility of the incident without blaming anyone and did not let anyone else of the team attend the press meet. However few years later, when the same team was successful in the same project, Dr Salim gave entire credit of success to his team and told them to conduct the press meet and kept himself in the background. This, he says is the principal quality of a leader. Whenever there is success a leader gives it to his team, and whenever there is failure it is the leader who takes responsibility. He had even worked for the Defence Research Development Organisation of India helping build India as a world nuclear power. He helped in various testing of nuclear weapons. Although these nuclear warheads where Weapons of mass destruction, Dr Kalam always maintained that piece can only prevail is the fighting ground is leveled. He called nuclear weapons has the weapons of peace which are necessary for maintaining a state of peaceful homeostasis in the world. Simple living and high thinking – perhaps know that person in the world lives out this phrase as much to its true sense of term than doctor Kalam. Even after being elected as the 11th president of India, unlike all the other presidents, he chose modest accommodations and never indulged in activities that would Tannish the seat of the president of India. Although a President is not given much power with regards to legislation as per the constitution of India, Dr Kalam tried his best to oppose bills that were against the interests of the nation. During his tenure as the President of India, he traveled the entire country meeting the youth, especially school children and college children motivating them to strive for success for the betterment of themselves as well as for the development of the nation. He believed that it is the youth which has the power to bring India the glory of its past when it was known as the ‘golden bird’ of the world.